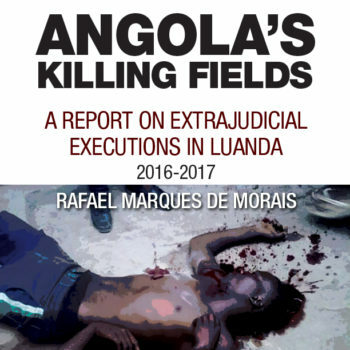 Reports from Luanda today (April 13) say that the Angolan National Director of Prison Services, Commissar António Fortunato, has responded to international outrage over the inhumane conditions in the prisons to which the 17 prisoners of conscience, sentenced in what has come to be known as the Luanda Book Club trial. Commissar Fortunato told Angolan National Radio (RNA) that the authorities would be moving all the imprisoned dissidents to one jail, Viana, one of the municipalities on the eastern outskirts of Luanda. Three of the jailed prisoners of conscience are already being held in Viana – the two female activists Rosa Conde and Laurinda Gouveia are in the women’s wing, while Laurinda’s partner, Nito Alves is in the male wing. Charged with conspiracy to plot a rebellion, and criminal association. Sentenced to four years and six months. Imprisoned in Viana Penitentiary. Sentenced to additional six months in prison in a summary trial for calling his trial a mockery. Manuel Baptista Chivonde, better known as “Nito Alves” was born in Kachiungo in Huambo province on April 15, 1996 to former combatant and National Police officer, Fernando Baptista and his wife Adália Chivonde. He took the name “Nito Alves” in homage to Alves Baptista “Nito Alves”, the infamous MPLA faction leader executed for allegedly plotting a coup against Agostinho Neto on the May 27, 1977. The family relocated to Luanda where the young Nito Alves created a controversial wall mural in his neighbourhood, Viana, echoing the headlines of independent publications such as Folha 8, which were critical of the ruling MPLA. This youthful nonconformism, led “Nito Alves” to join the first anti-government demonstrations organized in 2011. He ordered a controversial T-shirt to be made up, branding the President a “noxious dictator” and was arrested for doing so and accused of plotting to overthrow the President. This one only one of numerous protests over the years, even though he was still a minor. Consequently, he was repeatedly arrested (some ten times so far), detained without trial, beaten up and threatened with death. His father Fernando Baptista defends his son’s right to peaceful, legitimate protest: “When the youngsters discuss poor governance performance and they propose changes, they are within their rights. They are entitled to these rights”. Charged with conspiracy to plot a rebellion, and criminal association. Sentenced to four years and six months. Imprisoned in Viana Penitentiary. Laurinda Gouveia works as a cleaner and food vendor to pay for her post-secondary education. Her activism began when she tried to take part in a demonstration against President dos Santos in November 2014. Police officers accosted her, seized her cellphone, punched her and dragged her by her hair to a police vehicle which took her to a nearby school. Laurinda is said to be in a relationship with fellow activist Nito Alves. The state’s evidence against her, as with Rosa Conde, was that she had attended two meetings of the political study group held at the Kiazele bookstore in Luanda. She began a hunger strike four days ago in protest to demand the right to receive food directly from her relatives. Charged with conspiracy to plot a rebellion, and criminal association. Sentenced to two years and three months. Imprisoned in Viana Penitentiary. Rosa Conde is being held in the female wing of Viana Penitenciary on the eastern outskirts of Luanda. For the past four days she has refused food, choosing a hunger strike as the most effect means of protesting against her conditions of incarceration. As the partner of an Angolan journalist and human rights activist (Pedrowksi Teca), Rosa’s personal desire for greater social justice in her homeland and a desire to be better informed, coincided with the opportunity to become acquainted with a large variety of people of all backgrounds and beliefs. According to the state’s own evidence against her, she had only attended two meetings of the study group at the bookstore. The investigating magistrate who questioned her, after her arrest, demanded to know if she was related to the Portuguese MEP Ana Gomes (a figure seen as critical of the Angolan regime).